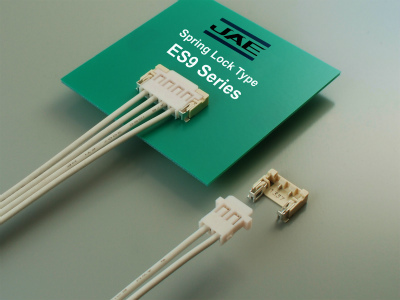 ES9 Series | Japan Aviation Electronics Industry, Ltd. Improved operability through upper-side mating. Easy to visually confirm the connector is mated. Original locking design structure (Spring Lock) achieves high retention strength in the cable lifting direction. Cable lifting-direction retention strength: 15N min. Improved contact reliability with a 2-point contact structure. 22 AWG (outer cable diameter: 2.1mm max.) compatible with a low-profile structure (product height: 3mm). Standrd product and cULus certified product.